A cleverly written, but over-directed Spaghetti Western from Ferdinando Baldi. Marketing Film R0 German disc. Family loyalty was a common theme in stories of the Old West with revenge for a father or mother's murder the usual driving force behind most anti-heros. 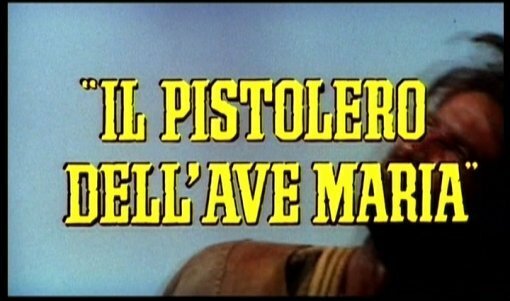 Writer and director Ferdinando Baldi had shot 5 Westerns before The Gunman of Ave Maria, and he had explored the theme of patricide previously in Texas Addio (1966) - this time he rather complicates matters with a far more detailed mix of characters and links. Mostly a dialogue based Western, there are a few action scenes - one of the big problem with Texas Addio (1966) is that the action scenes were rather crudely written in to the largely dialogue based script, here they are far more a part of the storyline, and fit in well. The film boasts an inevitable but tense climax with some unexpected turns. Baldi's quick-fire direction can take a lot of getting used too - his dialogue sequences rarely have the two talkers in the same shot, preferring to cut between extreme close-ups or long shots of each character as they speak, similarly the action scenes often have some very fast cuts. This technique can become rather nauseating at times and sometimes makes it hard to follow the conversation as it becomes very easy to get the characters muddled up. On the plus side, Baldi is expert at shooting in flaming buildings, and the film's firey climax sequence looks amazing. Composer Roberto Pregadio gives an appropriate and distinctive soundtrack to the film, he goes for the more traditional guitar and whistling theme rather than the songs that open most Spaghetti Westerns. None of the big names in euro-cinema are on the cast list but all of them perform their roles well. José Suárez is interesting casting as the father as he played the patricidal lead villain in Texas Addio (1966). The only problem comes because the three 'good-guys' all look rather similar, and can get confusing at times. The Gunman of Ave Maria is an interesting film with a good plot, but some rather over-edited direction in some scenes. A better than average Euro-Western it boasts a good firey climax, but lacks many exciting action scenes that denote many of the most popular Spaghetti Westerns and hence action fans probably won't enjoy this title so much. Recommended to Spaghetti Western fans who prefer more plot than action. Anyone famous in it? No-one of note. Directed by anyone interesting? Ferdinando Baldi - an often overlooked Italian director who made his home in the Euro-Western genre. Any violence? The usual fist, knife and gunfights - a little blood. Good soundtrack? Composer Roberto Pregadio gives the film a strong soundtrack that has often been re-used. A well written film, recommended to fans of the plot based Euro-Westerns. Visuals The film is shown at approximately 1.85:1 anamorphic wide-screen. Colour. Aspect ratio would appear to be correct. Audio English mono - sounds good, some very light hiss. German mono and 5.1 surround - sounds good, but the 5.1 mix is quite flat. Some light hiss. Italian mono - sounds good, with no hiss. Other regions? Japanese DVD, non-anamorphic print, but does include interview with director and deleted scene. Cuts? The film is believed to be uncut. Titles and credits are in Italian. A well written film, although often overdirected. It should appeal to fans of the plot based Westerns, but not enough action for some. The DVD has a good print and audio although extras are light. DVD Rewind - DVD release comparisons. Find our reviews of other Spaghetti Western titles, and films directed by Ferdinando Baldi. All text in this review written by Timothy Young - 26th July. 2006.